Led by event planner Maggie Cooper, this romantic styled shoot combines the well-known tale of Snow White with a rustic venue near Timmonsville for barn wedding inspiration that brings plenty of swoon-worthy moments. 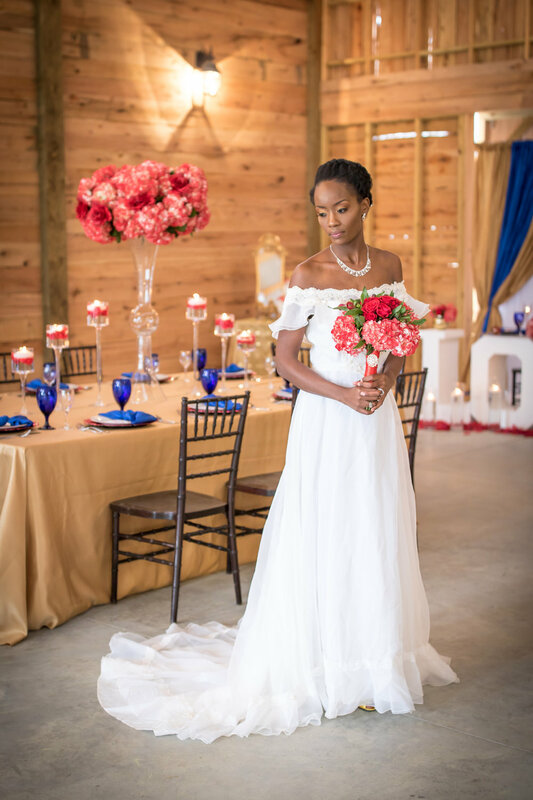 The red, gold, and blue accents are bold without overtaking the quiet country setting, and the carefully curated details elevate this styled shoot to something magical. 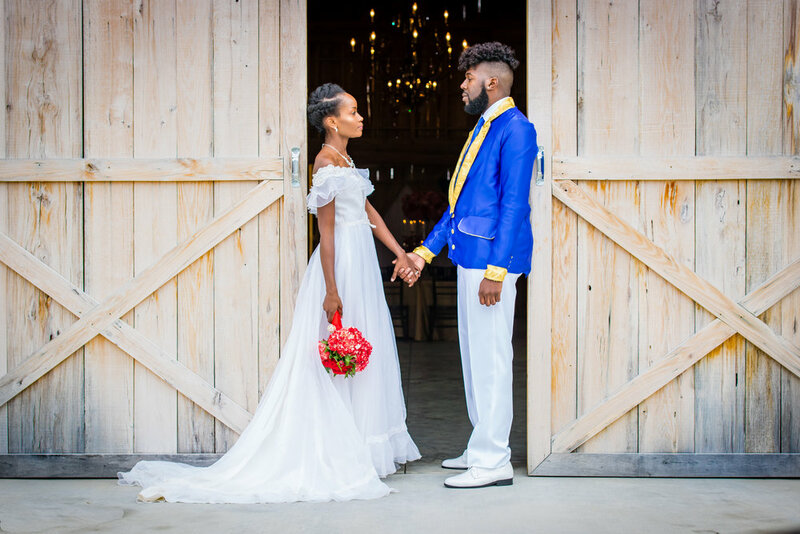 Photographers William Stukes from At Your Service Media and Gary Staggers from True Story Photography perfectly captured this chic fairytale inspired affair that showcases the best of what Pee Dee weddings have to offer. A full list of vendors is provided at the end of the post. "I was attending an event and someone introduced me to the manager of the Venue at Double C Farm. I explained to her my plans for a Princess-themed styled shoot, and she invited me to take a look at her property. Upon arriving at the venue, I was amazed at what I saw. 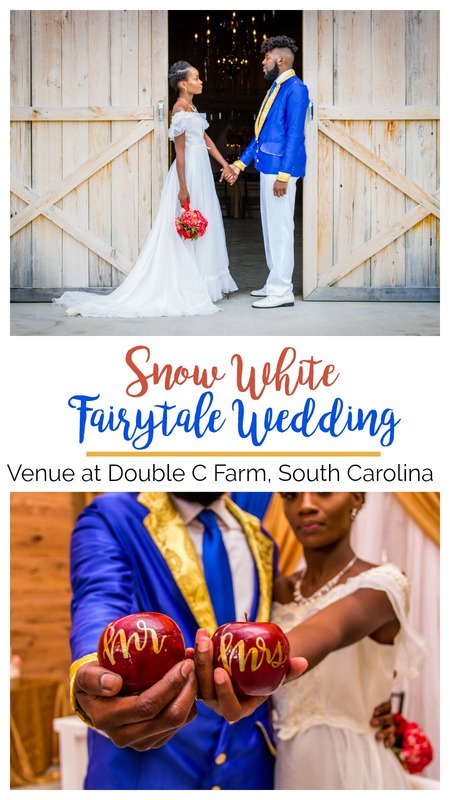 The Venue at Double C Farm had the beautiful backdrop of a forest and a building that was perfect for my vision of a Snow White-themed styled shoot. 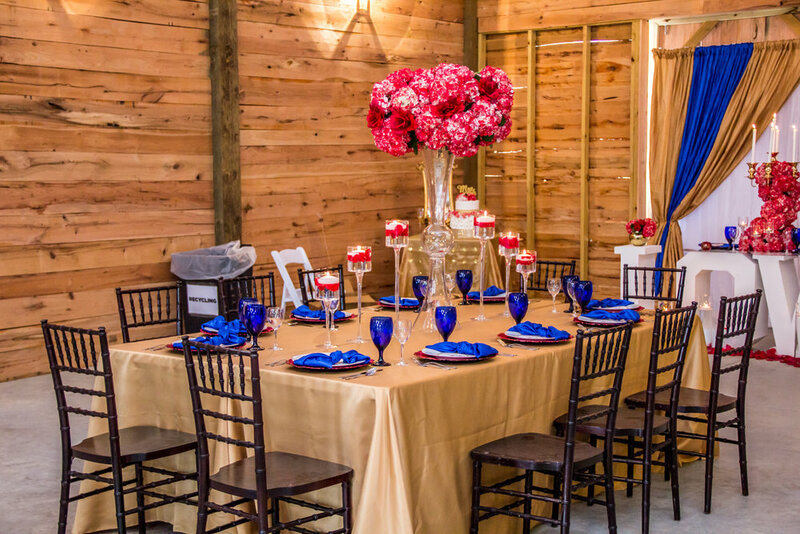 The venue has a beautiful lake, comfortable bridal cottage and the perfect barn for a dream wedding. I actually was looking at other venues, but what made me choose The Venue at Double C Farm was their custom service. They were incredibly delightful and personable. These are definitely the qualities you look for when collaborating with others and choosing vendors." "My vision for the shoot was to create a wedding scene for Snow White and her Prince Charming. As a child, and as an adult, I love fairytales because they give you a sense of always having a happy ending despite all the ups and downs. Snow White is one of the original princesses, and in my opinion one of the most forgotten, so I decided to highlight her. There were so many times that I was going to choose another theme or highlight another character, but I held true to my vision. My inspiration was my daughter. As any little girl, she love princesses so I decided this would be a great way to dedicate my first styled-shoot to my daughter, Madisyn, my first 'true love.'" "The thing I loved about the venue was the rustic look of the place, and the bridge that leads to the lake. I'm kind of a outdoorsmen, so I appreciate a beautiful landscape." One of the challenges I faced in planning the styled photo shoot was trying to find red hydrangeas. My wholesaler was unable to provide them for me, so I had to search and reach out to all my resources to find them. Luckily, I was able to find a vendor online that was able to accommodate me. Another challenge I faced was trying to make sure it was a Snow White theme, and not a Beauty and the Beast theme because the colors are similar. I had to add the elements of apples and a mirror to achieve my theme vision. Finding vendor participation was actually the easiest part of planning this shoot, and I thank them sincerely for agreeing to be a part of it. It is so hard to narrow down the favorite elements of my shoot. One element that stuck out to me was the LOVE Table setup. 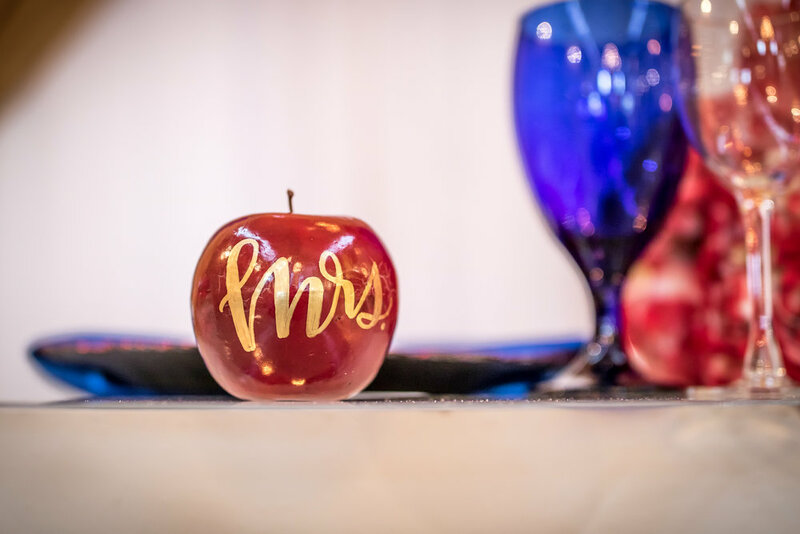 I enjoyed the intimate details that were displayed on the table; such as the Mr. and Mrs. apples, the red flowers draped around the candelabra and the usage of various candles. Another element I enjoyed was seeing the chemistry that the models displayed to create the sense of love that was needed to create a successful shoot. Lastly, I absolutely love seeing the colors royal blue, red and antique gold come together. I was little concerned that they might have not blend together, but I took the chance anyway.